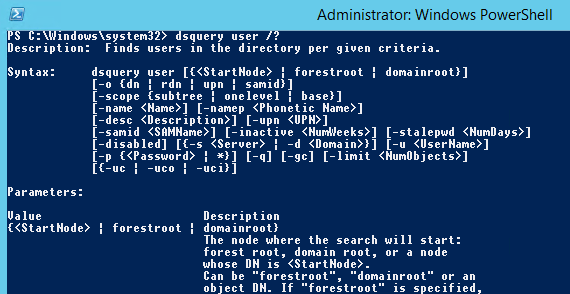 Dsquery.exe is a command-line utility for obtaining information about various objects in the Active Directory domain. The utility is available in all Windows Server versions by default. To use it on desktop OSs, you need to install the appropriate version of Remote Server Administration Tools. The last command is used to find any objects in the AD directory using a common LDAP query. Consider some useful examples of using the dsquery command to retrieve information from the AD. By default, the dsquery utility allows you to display only 100 objects from AD. To use the command to return more than 100 results, use the -limit argument. The -limit 0 option means that the results in the output are unlimited. At first glance, the syntax of the dsquery utility is quite complex. But if you try to execute several queries yourself, you will realize that most dsquery subcommands use the same standard syntax and contain only a few extensions of the standard syntax that are specific to the type of object they are working with.